Support comes from labelmates DOWNFALL OF GAIA! After the successful release of ‘Phanerozoic I‘ last November, THE OCEAN COLLECTIVE are now looking forward to present their new album to the audiences. The European campaign will kick off in March in Stuttgart, Germany and the tour will last nearly four weeks hitting a whole bunch of different countries. 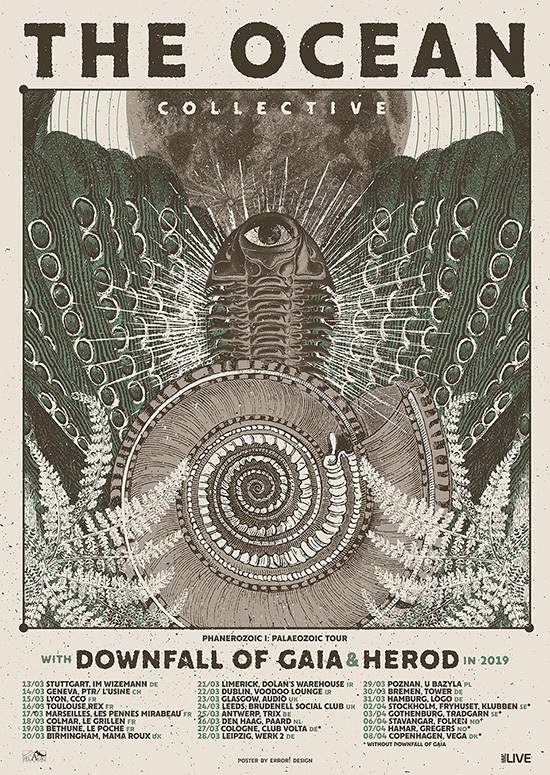 DOWNFALL OF GAIA, who will release their new album ‘Ethic Of Radical Finitude‘ on February 8th via Metal Blade Records, will be supporting THE OCEAN COLLECTIVE on this tour. Opening up will be HEROD from Switzerland. ‘Ethic Of Radical Finitude‘ is DOWNFALL OF GAIA‘s most melodic, most structured and most dynamic release to date, once more building upon the epic and unique sludgy, crusty, exploratory metallic sound that has organically evolved with every release. Surf over to metalblade.com/downfallofgaia where you can stream the first single ‘As Our Bones Break To The Dance’ and pre-order the album!